The UPA attaches the highest priority to the development and expansion of physical infrastructure like roads, highways, ports, power, railways, water supply, sewage treatment and sanitation. UPA Government also reiterates the commitment to an increased role for private generation of power and more importantly power distribution. Railways constitute the core of our infrastructure. Public investment for its modernisation, track renewal and safety will be substantially increased. Railway reforms will be pursued. The UPA Government commits itself to a comprehensive programme of urban renewal and to a massive expansion of social housing in towns and cities, paying particular attention to the needs of slum-dwellers. The UPA will pay special attention to augmenting and modernising rural infrastructure, consisting of roads, irrigation, electrification, cold-chain and marketing outlets. To attract new investment and to quicken the implementation of projects, Budget 2013-14 proposes to introduce an investment allowance for new high value investments. A company investing `100 crore or more in plant and machinery during the period 1.4.2013 to 31.3.2015 will be entitled to deduct an investment allowance of 15 percent of the investment. .Infrastructure Debt Funds (IDF) have been encouraged. These funds raise resources and, through take-out finance, credit enhancement and other innovative means, provide long-term low-cost debt for infrastructure projects. In the last two years, a number of institutions were allowed to issue tax free bonds. They raised Rs 30,000 crore in 2011-12 and are expected to raise about Rs 25,000 crore in 2012-13 Budget 2013-14 proposes to allow some institutions to issue tax free bonds strictly based on need and capacity to raise money in the market, upto a total sum of Rs 50,000 crore. New industrial cities in the DMIC region are being benchmarked against recently established industrial cities in other parts of the world. Approximately 180 million people, 14 percent of the population, will be benefitted by the corridor’s development. India having 3.34 million kilometers of road network is the second largest in the world. This comprises only 1.7% of the total road network, but carries over 40 % of the total traffic. The UPA Government has approved a Special Accelerated Road Development Programme for the Northeast to improve about 10,141 km of roads including Arunachal package. The phase 1 of SARDP-NE including Arunachal Package covers 6,418 km an estimated cost of Rs 33,688 crore . So far about 1,000 km have been completed. 3,000 kms on National Highways to be added in first six months of 2013-14 in the states of Gujarat, Uttar Pradesh, Karnataka, Madhya Pradesh, Rajasthan and Maharashtra. 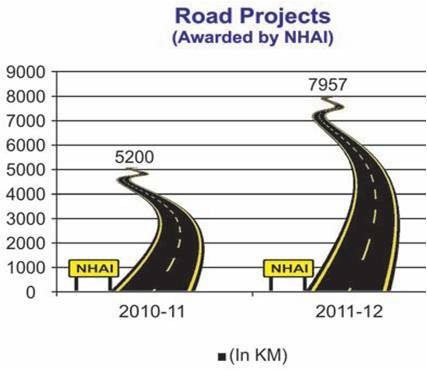 NHDP Phase-III involves four-laning of 12,109 km of national highways, having high density corridor connecting state capitals, important tourist places, economically important areas, etc. 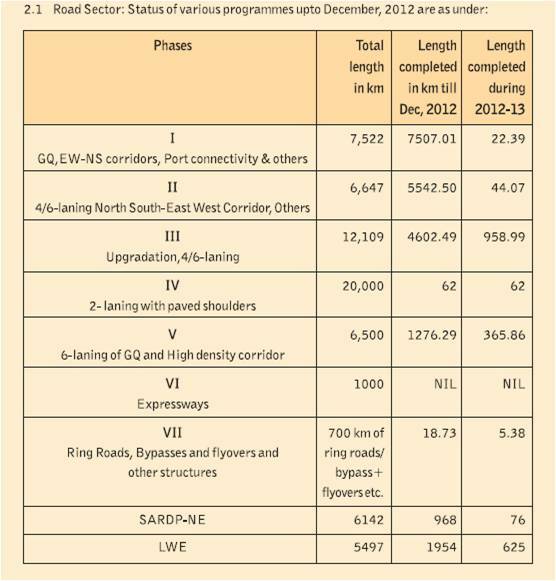 2579 kms of of roads in Left Wing Extremist hit areas out of 5487kms have been completed as on December 2012. Under the new Electronic Toll Collection System, a road user can travel seamlessly without stopping at Toll Plazas with electronic payment of user fees. It will be expanded to other parts of the country within the next 2 years. The civil aviation sector has witnessed unprecedented growth in recent years, with aviation coming within the reach of common people. Currently India is the 9th largest aviation market handling 121 million domestic and 41 million international passengers. Today, more than 85 international airlines operate to India and 5 Indian carriers connect over 40 countries. Oxford Economics report commissioned by IATA indicates that Aviation accounts for 1.5% of India’s GDP and supports 1.7 million jobs – with a further 7.1 million employed in other sectors including tourism through the catalytic effects of aviation. Government has allowed direct import of Aviation Turbine Fuel (ATF) by Indian carriers, so that , so that cost of operations of airlines in India is reduced. Airlines have to pay heavy sales tax levied by the State Governments on ATF, this can now be avoided. Only in Gulf and South East Asian countries, there is an enhancement of approximately 81,000 seats per week which is about 80% more than their present entitlements. At present 5 major airports are being operationalized under PPP mode at New Delhi, Mumbai, Bangalore, Hyderabad and Cochin. New international airport has been inaugurated at Hyderabad and that at Bangalore have been commissioned in 2008 itself. Government envisages an investment of US$ 12.1 billion at Indian airports under the 12th Five-Year Plan, of which a contribution of about US$ 9.3 billion is expected from the private sector. The Government is in the process of introducing a bill in Parliament which will enable replacing the existing DGCA with a more autonomous Civil Aviation Authority. The CAA will be a self-funding entity and shall have financial and operational autonomy. Operation in domestic sector has been deregulated. As such airlines are free to operate anywhere in the country subject to compliance of Route Dispersal Guidelines. The Government has recently cleared Flexi Use of Airspace (FUA) by civil and military users. There will be a reduction of carbon emission by about 7 million kg. per annum by direct routing between 7 major city pairs only because of FUA. The creation of ANS Corporation from the existing AAI is one of the top most priorities of the Government so as to boost the pace of modernisation and upgradation of technology in the field of air navigation. To ease the pressure on the existing Mumbai airport, Government has taken an initiative to develop Juhu airport which will augment the capacity of existing Mumbai airport. Government has agreed to provide equity infusion of over Rs30,000 crores to Air India to enable it to turn around and come back into profit. ECB upto $ USD 1 billion has been permitted for the airlines to meet their working capital requirement. Construction of new airports and buildings was completed at Jalgaon, Lucknow, Indore and Rajahmundry. To delink accident investigation from the regulator DGCA, an AirInvestigation Bureau has been set up under the Ministry. The Government of India has also approved 15 more airports under the Greenfield Airports Policy being developed, majority under PPP mode. New Integrated terminals equipped with modern state-of-the-art facilities commissioned at Indore, Lucknow and Raipur airports. Tiruchirapalli, Coimbatore, Mangalore, Varanasi and Lucknow airports as declared as International airports. The Government is working on the Creation of Civil Aviation Security Force. A team of experts from the International Civil Aviation Organization (ICAO) to carry out a detailed study of the existing security system at the airports and suggest measures to improve the same. Skill augmentation in civil aviation sector through a vibrant, world class aviation education and training: In this regard, the work to establish a Civil Aviation University is under progress. To upgrade and modernize maritime infrastructure, the National Maritime Development Programme, comprising 387 projects, has been completed. Kakinada-Puducherry canals along with Godavari and Krishna rivers (1078 km)-NW-4 declared in 2008. East Coast Canal integrated with Brahmani river and Mahanadi delta rivers (588 km) – NW-5 declared in 2008. A Bill in the Parliament has been introduced for declaring one more Lakhipur-Bhanga stretch (121 kms.) of the Barak River as a National Waterway. Indian Shipping industry has been provided cargo support in the form of right of first refusal & policy of Free On Board (FOB) import is being followed for government owned/controlled cargoes. With a view to provide a level playing field to the Indian shipping sector the Government introduced the tonnage tax system during 2004-05 which has effectively brought down the tax liability of shipping companies to a level comparable to the international levels from the previous levels of the corporate tax regime. Major ports have improved their efficiency of operation particularly in terms of turnaround time (TRT) Average TRT for all major ports improved from 8.10 days in 1990-91 to 4.47 days in 2011-12. The number of passenger trains has increased from 8897 in 2001-02 to 12335 in 2011-12. Train Protection Warning System (TPWS) onautomatic signalling systems has been introduced. 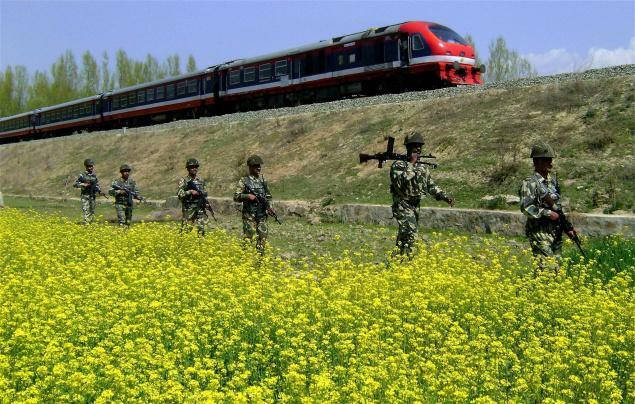 Rail works on the new line railway project to connect state of Manipur are in full swing. Revamped participative policy enabling partnershipwith ports, large mines, industry and investors addresses the specific concerns of private investors. Fuel Adjustment Component (FAC) – now linked revision in only freight tariff from 1st April, 2013. A proposal or setting up ofan independent Rail Tariff Authority has been formulated. Construction of metro system in Kolkata from Dum Dum toNoapara is scheduled to be completed by March, 2013.